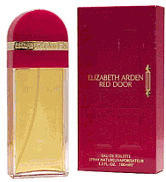 Elizabeth Arden introduced Red Door in 1989. This feminine scent possesses a blend of red rose, violet, jasmine, lily of the valley, and orchid. Accompanied by a touch of honey. Red Door is recommended for romantic use. Buy 1 for $27.00Buy 2 / Save $1.44!Buy 3 / Save $5.40!